Posted August 26th, 2015 by admin & filed under Hand/Wrist. Sometimes the smallest injury that looks so simple, is the most frustrating. Like why is it even a problem?? A mallet finger is an injury that occurs to the tip of the finger or thumb where it can no longer straighten by itself. It usually happens when you jam it into an object forcefully such as when catching a ball. The force of the hit ruptures the terminal extensor tendon that straightens the tip of finger and now the tip of the finger droops and is unable to straighten by itself. At times the force is so hard that a small piece of bone is broken off. X-rays are usually taken to see if there are any fracture or nonalignment. Worst case if left untreated is that you can develop a swan neck deformity causing you to lose functional use of your finger/hand and have a lot of pain. The result of a mallet finger after injury is pain and swelling at the tip of the finger. 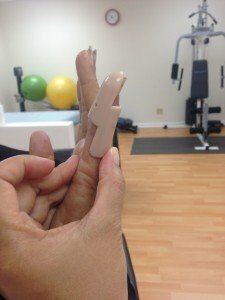 The general protocol for conservative treatment of a mallet finger is to splint the tip of the finger straight for approximately 6-8 weeks and then start to move it as long as it is stiff and does not droop. Sounds easy right? It should be….but it isn’t always. Different types of splints are used by various places. Options consist of aluminum splints are taped on, stack splints, or a custom fitted orthosis is fitted to fit you by a hand therapist. THE most important thing is to ONLY splint the small knuckle (DIP) allowing the other knuckles to move. The other MOST important aspect of treating mallet fingers is to educate you, the patient, that the tip of the finger is to remain STRAIGHT for the entire 6-8 weeks without falling down….otherwise the stiffening/healing process is interrupted. I decided to write about mallet fingers because I just got a new case. She came to me after injuring her hand 6 weeks ago when she went to catch an object that was falling and jammed her finger. Immediately she could see that her finger drooped and she had a lot of pain and swelling. In the urgent care center, X-rays determined that she had no fractures. She was fitted with a stack splint to wear. 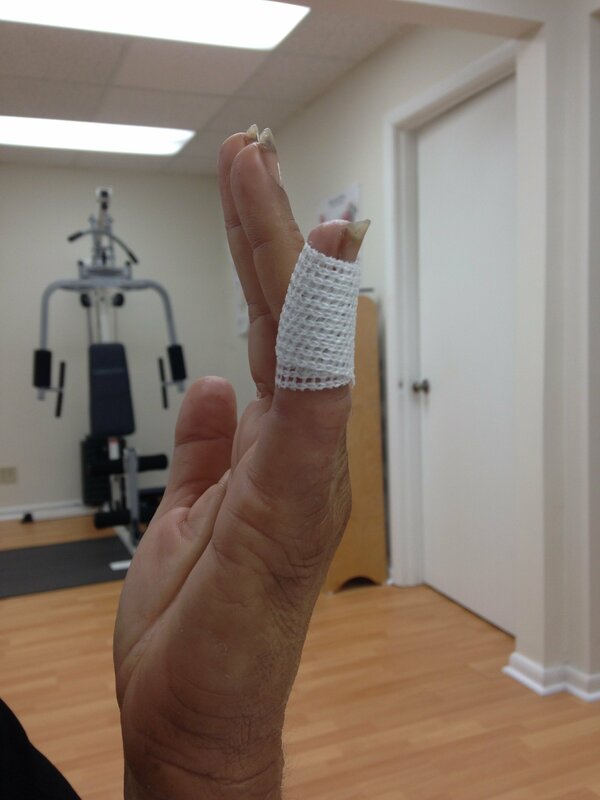 When she came to me, she had the stack splint on with the splint taped to her finger at the middle knuckle (PIP) and coban wrap that covered the length of her finger. She could not bend her finger at all, but her little knuckle (DIP) was drooped down to 30 degrees. I don’t know what happened before she came to me, all I know is that both of the most important treatment elements were not met for whatever reasons. Here’s what we started to do. We need to stretch and get that DIP knuckle straight as well as massaging the finger to help reduce the swelling. I like to use quick cast to keep it straight but allowing the other joints to bend. It also can be kept on while washing your hands and it will dry without messing up the skin. The compression also can help with the swelling. Another option is a custom fitted orthosis made of thermoplastic material, which is great but now when you take it on and off, you have to make sure that you keep that DIP from falling down. So far so good. Looks great, she can move the other two knuckles with pain but at least it’s becoming more functional. It’s not easy…we have to work to help reduce the swelling, and bend as much as possible the middle knuckle while keeping that little one straight. Conservative treatment can take time. I think we have to start from the beginning and let it stay straight for at least 6 weeks while the incorporating the small finger into her activities of daily living. 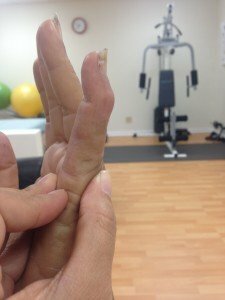 If this doesn’t work, and the deformity of the mallet finger interferes with her function, then she will need to speak with her hand surgeon to explore other options. Surgical management will have to be another blog…. Have your own story? Let us know in the comment section! Have any questions? Please give us a call here at Hands on Therapy Services for more direct help and set up your therapy appointment! Hands on Therapy Services is a leading Miami certified hand therapist, specializing in rehabilitation of shoulder, elbow, wrist, and hand injuries resulting from injuries, surgery, or naturally occurring conditions. Our Miami hand therapy services are provided by our certified hand therapist in Miami. We also offer occupational therapy in Miami with our on site occupational therapist. Plus – coming soon – we will be offering physical therapy in Miami. Thank you! They seem so simple but can be one of the hardest to treat.